Archives of Eaton Bray News for March 2007. This article was published in March 2007. Please see Latest News for more recent information. Would you like to lead the Carnival Procession and open the Fete on Saturday 7th July? Are you aged between 8 and 13 years? If so you could be the Carnival Queen or Princess we are looking for. To take part all you have to do is complete and return an entry form and come along to Eaton Bray Village Hall on Sunday 15 April at 11.15am when the Queen, Princess and two Attendants will be chosen. See the St Mary's Village Carnival website for more details. The Lions can and have played better during the season but on Saturday forgot the training given by coach Paul Cook. There were a few good performances however from James Pratt, Jack Nevitt Archie Bunker (in goal for second half) and Thomas Rainbow in defence. The Lions goals came from Jack Nevitt in the first half and Jack Cook in the second, passing and positional play in the initial stages was impressive from the Lions but this quickly fell apart as the score against them increased. The Lions have a squad of very good players and we know they will perform much better in the future. Man of the match was James Pratt a shining example to the team. The squad comprised Jack Cook, Thomas Rainbow, Jack Nevitt, James Pratt, Archie Bunker, Charlie Gamble and Elliot Whitcombe. The small, sloping pitch did not lend itself to attractive football, but Lions had a couple of early shots just wide whilst Bramingham's speculative downhill shots were safely gathered by goalie, Charlie Oliver. A huge kick from Oliver reached Jack Coates and a pass to Sam Marshall resulted in the first goal. Lions' Gus Thorne lobbed a free-kick to Coates, who headed it down and cracked it in with his left foot for the second. Bramingham looked dangerous with a couple of corners but Lions defended well. In the second half the Bramingham goalie made a superb diving save to stop Jonnie Moriarty's shot, but Moriarty later succeeded with an impressive free-kick which just dipped under the crossbar. Lions' Matt Audouard gathered the ball in midfield and threaded a long pass forward to Coates who beat the goalie with a low, hard shot. Andy Scott-Lewis was Lions' MoM for his tireless work in midfield. St Martins probably expected an easy ride (after their 8-1 home victory) but Lions were determined to produce a good performance in their final match (of the season and their career). Lions made most of the attacking play in the first half, with particularly good efforts by Alex Kirkwood and Dylan Taylor. Taylor had a shot saved and another which hit the underside of the bar. A shot by St Martins was cleared off the line by Alex Smith and Lions' goalie, Dean Clark, made good saves. Lions' captain, Rob Gadsden, took a free-kick which was tipped over the bar by the goalie and later his shot curled just wide of the top corner. In the second half a reversal of fortunes saw St Martins forcing good defensive play by Lions, particularly from Sam Blumsom. Despite several corners St Martins were also unable to capitalise on their chances and the match remained goalless but thoroughly entertaining. The first half was exciting with Luton Leagrave dominant in attack initially, stopped on two occasions by Jack Nevitt in goal for the Lions. Jack Cook showed exceptional skills cutting in from the wing to score a cracking goal with his right foot for the Lions to go one up at half time. The second half saw Luton Leagrave equalising in the first minute only for Dylan Karavadra to score an opportunist goal for the Lions to go 2-1 up. This was quickly followed by a superb free kick from Jack Cook to see the Lions achieve a 3-1 win against a team halfway up the league. MoM was deservedly awarded to Cook. The squad comprised Jack Cook, Thomas Rainbow, Charles Gamble, Jack Nevitt, James Pratt, Archie Bunker, Dylan Karavadra and Elliot Whitcombe. The Lions began slowly and it was no surprise when Luton took the lead, firing home a corner from close range. Towards the end of the half Lions got their passing game together. Jayden Newman and Ellis Turrell create an opening for captain William Poole. William finished well flicking the ball past the advancing keeper to equalise. The Lions started the second half much brighter and took the lead. Crunching tackles from Jayden and Ellis won the ball for Matt Glover who went on an excellent run past a couple of defenders before firing in a low shot. The Lions continued to play well but couldn't find the third goal. Charlie Slater was close with a header from a Lions' corner. Luton pressed for an equaliser and with two minutes remaining they scored an excellent goal when an out-swinging corner was volleyed in by their captain. Only two weeks ago, we ran a story about pooches at an Eaton Bray kennels in search of new owners. We featured four hounds at Appledown Kennels but there were many more looking for a place to settle. One of the most popular dogs was Charlie, pictured, a five-year-old Cavalier King Charles Spaniel, who had a pretty bad start in life as a stuf dog on a puppy farm in Ireland. Charlie, deaf and with one of his eyes in need of permanent medication, was taken by a dog lover who could be with him all day. Appledown owner Julie Shelton said: "The lady had looked after special needs children so she was absolutely fine with him and just loves him. "We had a lot of people phone about Charlie. We had about seven or eight good homes come forward for him but this one was just perfect for his needs and it's working out well." And two other dogs, not featured in the newspaper, were also given a new start by readers who visited the kennels after reading about the needy pets. There is a constant flow of discarded dogs coming into the site and as many as 40 are still looking for someone to provide them with a fresh beginning and a loving home. Anyone interested in providing a dog with a new home should call Appledown Kennels, Harling Road, Eaton Bray, on 01525 220383. Kind-hearted Eaton Bray folk have raised more than £2,000 to help a hospital in Uganda. Local physiotherapist Rebecca Baldock returned to St Mary's Church as part of her annual holiday to pick up a cheque for the Kagando Hospital. During 2006 the congregations of St Mary's and All Saints Dagnall collected £5,291 between them. Rebecca said that because of the support offered by the churches the hospital - close to the border with the Democratic Republic of Congo - has now been equipped with basic equipment, including a blood pressure monitor. A path has also been built thanks to donations, which means wheelchairs and patients with crutches can now move between surgical wards and the physiotherapy department. During her talk Rebecca also highlighted the hope that the hospital brought to local people, and stressed how grateful the community was for the churches' fundraising efforts. Just as the nursery rhyme says "four and twenty blackbirds" were prepared for lunch at Eaton Bray Lower School on Wednesday. Not real ones of course ... but carefully sculptured birds made with icing by the school's kitchen staff. 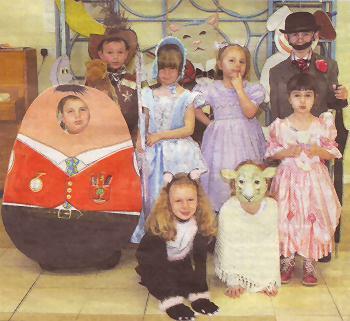 To celebrate World Book Day, children and teachers dressed up in poetry and rhyme costumes. Little Bo Peep and her sheep proved very popular among the four to nine-year-olds, as was Humpty Dumpty. The children read and wrote poetry and sang nursery rhymes during the day. Even the school site agent joined in - sporting a cow outfit complete with moon. Head teacher Sue Hounslow said: It was a great day and hopefully it has increased their love for books." The final council tax tot-up has taken place, so South Beds householders can now check out how big their bill will be for 2007/08. Council tax bills are made up of shares for various different authorities, who provide all sorts of services for people in South Beds. The last piece of the council tax jigsaw for the coming year has just been clicked into place, at South Beds District Council's budget-setting meeting. Councillors voted through the Tory budget, which means that the district council's share of the council tax will go up by 2.99 per cent this year. Executive committee councillor Philip Penman, who has special responsibility for resource management, said: "We are increasing the district council tax by 2.99 per cent - less than the rate of inflation, and so this is a reduction in real terms in the amount our residents will pay to us in the coming year. "I have budgeted for the same low increase for the next four years, too. By running South Bedfordshire District Council efficiently, and by listening to what out residents want, I am delighted that we can provide a wide and growing range of high quality services, while reducing the burden of council tax." Both teams struggled on the muddy pitch first of all. If anything, Stopsley attacked the most and only the staunchest of defending by Lions kept them from scoring. Lions did provide a couple of good runs down the left wing, but the Stopsley keeper played excellently. His positioning and quick reactions stopped Lions' forwards Gus Thorne and Jack Coates from scoring many times. The second half favoured the Lions. They had most of the play, and as usual in football, the other team got a goal first. Lions weren't downhearted and tried again numerous times to beat the Stopsley keeper. The save from Jack's scissor kick was world class! Matt Audouard got close as well, but the ball just wouldn't go in the net. Jonnie Moriarty's crosses and constant hard work in the middle earned him MoM. Eventually a Lions equaliser came from a corner, courtesy of James Thiel. A draw was a fair result. Lions opened the scoring after five minutes when a free-kick parried by Bedford's goalie was pounced on by Dylan Taylor. Bedford equalised but were soon matching Lion's attacks and both goalies made some effective saves. Unfortunately for Lions, the referee judged that a shot which hit the underside of the crossbar and fell to the goalie had crossed the line and Bedford finished the first half ahead. Luck was still against Lions, with Bedford scoring from a controversial penalty and gaining a fourth by beating the offside trap in spectacular fashion. Lions' captain, Rob Gadsden, took the ball round four players and unleashed a scorching shot to score their second. Martin Coates was awarded Lions' MoM. The next parish council meeting will take place on Monday 2nd April 2007 at 7.30pm. The discarded pooches are all being kept at Appledown Kennels while new owners are found and bosses there are hoping readers will be willing to help. They are asking people to take a look at these lovable hounds and consider making one of them a member of their family. But it's not just the four mutts in need of a new start, there is a constant flow of dogs coming through the kennels with the fashionable Staffs topping the list of over-bred and notneeded pets. The dogs appealing to readers this week are - Dylan, Bexley, Charlie and Dandy. Anyone interested in providing one with a new home should call Appledown Kennels, Harling Road, Eaton Bray, on 01525 220383. Dandy is one of a number Staffordshire bull terrier crosses at Appledown. He was a stray about to be put to sleep and is about two years old. Kennel boss Julie says he wonderful with other dogs. "His temperament is great and he appears to be clean:' she says. "Dandy will chew his own legs if he gets bored, so he needs to be with someone who is at home for most of the day." 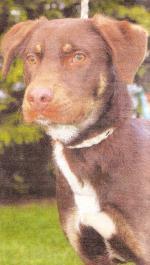 Dylan is a three- or four-year-old castrated cross-breed. Appledown boss Julie Shelton says he is one of a few very large crossbreeds they have and he is very good natured and very clean in his kennel. "He is tolerant of other dogs, but would be better living alone;" says Julie "He spends much of his day in bed, but he loves a good walk." Charlie, a five-year old Cavalier King Charles spaniel, is said to have a wonderful temperament. He was a stud dog on a puppy farm in Ireland so had a pretty bad start in life. Deaf and with one of his eyes in need of permanent medication, he is nevertheless said to be "a very happy little dog". Bexley is a 10-month-old labrador cross saved from "death row". He is a happy, lively medium-sized dog who loves everyone and everything and is very responsive to training and travels well. "Bexley would make a great family pet, but we expect he would chew until he grows up a bit;' the kennel owner says. It may only be the end of February today, but I've got some news about Christmas for you. Yes, yes, I know we haven't had Easter yet. But festive puzzle master Gordon Gray, of Northall, has already set his Christmas charity challenge for this year. How's that for being organised? Hold your horses, though - the puzzle won't be available to tackle until December 8. Just giving you a little advance notice. Last year's puzzle has raised £3,000, split equally between the Friends of Kagando Hospital, Uganda, and the roof fund for St Mary's Church, Eaton Bray. Since the annual puzzle was launched, back in 1991, it has raised an amazing £24,065. Why the Kagando Hospital, you ask. Well, that was the St Mary's 2006 parish project. Physiotherapist Rebecca Baldock has been working at the hospital, and has been sending back regular updates to the United Kingdom. Rebecca's father Martin is a former Dunstable Grammar School head boy, who went on to become a vicar, and her grandfather Eric Baldock ran a chemist's at the top of George Street, in Dunstable, until his retirement. Her friends and family are sure to be glad that she's flown home for a brief holiday. And she'll be giving an illustrated talk at 8pm on Monday, March 5, at St Mary's, Eaton Bray. PS. Don't forget to circle the date of December 8 in your diary. That's the day to dust off your thinking caps for Gordon's latest perplexing puzzle. You are viewing the March 2007 archive.